I saw this recently at a car show and have been unable to identify it. 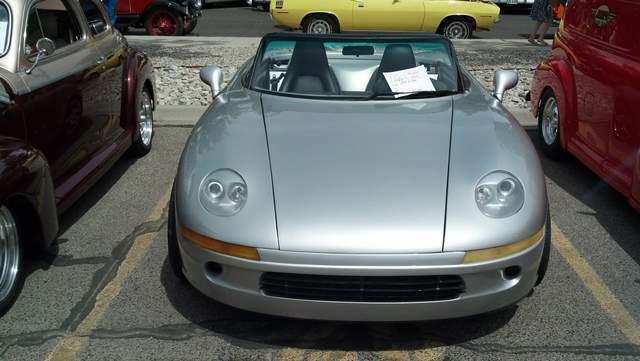 The placard says it's a 1989 Porsche Spyder, but there were no Porsche badges on it and a logo on the dash suggested it has a V8. 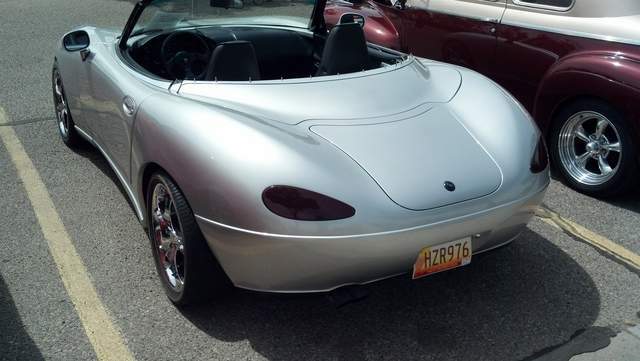 I suspect it's a kit car of some sort, but can't figure out why it's labeled as a Porsche. Wishful thinking? Perhaps it's on a 928 chassis? I am betting it i some sort of kit. Not bad looking IMO. That is one fugly automobile. That picture looks more like a Catfish. You say tomato, I say potato. Looks like a 550 spider replica. Nice lines. Ya gotta check the windshield frame. Thats the one part of a car thats usually never modified. I'm gonna say it'a a Gen 2 Miata with a LOT of fiberglass work. great quality work! The rear design looks MUCH nicer than the front. I guess the only real Porsche spyder was the placard but not the car itself. I'm gonna say it'a a Gen 2 Miata with a LOT of fiberglass work. great quality work! The doors - and door handles - sure look like an NB (second gen) Miata. that is a rebodied one-off 928 spyder. Most 928 guys are not fans (it has been well covered on rennlist in the 928 forum). I'm not. I like my Boxster looking like a Boxster, and my shark looking like a shark, not this in-between stuff!